For other uses, see Won't Get Fooled Again (disambiguation). "I Don't Even Know Myself"
(1970) "Won't Get Fooled Again"
"Won't Get Fooled Again" is a song by the English rock band the Who, written by Pete Townshend. It was released as a single in June 1971, reaching the top 10 in the UK, while the full eight-and-a-half-minute version appears as the final track on the band's 1971 album Who's Next, released that August. Townshend wrote the song as a closing number of the Lifehouse project, and the lyrics criticise revolution and power. To symbolise the spiritual connection he had found in music via the works of Meher Baba and Inayat Khan, he programmed a mixture of human traits into a synthesizer and used it as the main backing instrument throughout the song. The Who tried recording the song in New York in March 1971, but re-recorded a superior take at Stargroves the next month using the synthesizer from Townshend's original demo. Ultimately, Lifehouse as a project was abandoned in favour of Who's Next, a straightforward album, where it also became the closing track. It has been performed as a staple of the band's setlist since 1971, often as the set closer, and was the last song drummer Keith Moon played live with the band. Townshend had been reading Universal Sufism founder Inayat Khan's The Mysticism of Sound and Music, which referred to spiritual harmony and the universal chord, which would restore harmony to humanity when sounded. Townshend realised that the newly emerging synthesizers would allow him to communicate these ideas to a mass audience. He had met the BBC Radiophonic Workshop which gave him ideas for capturing human personality within music. Townshend interviewed several people with general practitioner-style questions, and captured their heartbeat, brainwaves and astrological charts, converting the result into a series of audio pulses. For the demo of "Won't Get Fooled Again", he linked a Lowrey organ into an EMS VCS 3 filter that played back the pulse-coded modulations from his experiments. He subsequently upgraded to an ARP 2500. The synthesizer did not play any sounds directly as it was monophonic; instead it modified the block chords on the organ as an input signal. The demo, recorded at a slower tempo than the version by the Who, was completed by Townshend overdubbing drums, bass, electric guitar, vocals and handclaps. 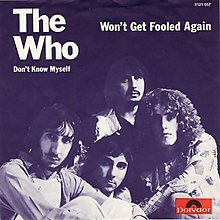 Brief sample from the song "Won't Get Fooled Again"
The Who's first attempt to record the song was at the Record Plant on W 44 Street, New York City, on 16 March 1971. Manager Kit Lambert had recommended the studio to the group, which led to his producer credit, though the de facto work was done by Felix Pappalardi. This take featured Pappalardi's Mountain band mate, Leslie West, on lead guitar. Lambert proved to be unable to mix the track, and a fresh attempt at recording was made at the start of April at Mick Jagger's house, Stargroves, using the Rolling Stones Mobile Studio. Glyn Johns was invited to help with production, and he decided to re-use the synthesized organ track from Townshend's original demo, as the re-recording of the part in New York was felt to be inferior to the original. Keith Moon had to carefully synchronise his drum playing with the synthesizer, while Townshend and Entwistle played electric guitar and bass. Townshend played a 1959 Gretsch 6120 Chet Atkins hollow body guitar fed through an Edwards volume pedal to a Fender Bandmaster amp, all of which he had been given by Joe Walsh while in New York. This combination became his main electric guitar recording setup for subsequent albums. Although intended as a demo recording, the end result sounded so good to the band and Johns, they decided to use it as the final take. Overdubs, including an acoustic guitar part played by Townshend, were recorded at Olympic Studios at the end of April. The track was mixed at Island Studios by Johns on 28 May. After Lifehouse was abandoned as a project, Johns felt "Won't Get Fooled Again", along with other songs, were so good that they could simply be released as a standalone single album, which became Who's Next. The full-length version of the song appeared as the closing track of Who's Next, released in August in the US and 27 August in the UK, where it topped the album charts. "Won't Get Fooled Again" drew strong praise from critics, who were impressed that a synthesizer had managed to be integrated so successfully within a rock song. Who author Dave Marsh described singer Roger Daltrey's scream near the end of the track as "the greatest scream of a career filled with screams". In 2011, the song was ranked number 134 on Rolling Stone's The 500 Greatest Songs of All Time. As of March 2018 it was certified Silver for 200,000 sold copies in the UK. The Who first performed the song live at the opening date of a series of Lifehouse related concerts in the Young Vic theatre, London on 14 February 1971. It has subsequently been part of every Who concert since, often as the set closer and sometimes extended slightly to allow Townshend to smash his guitar or Moon to kick over his drumkit. The group performed live over the synthesizer part being played on a backing tape, which required Moon to wear headphones to hear a click track, allowing him to play in sync. It was the last track Moon played live in front of a paying audience on 21 October 1976 and the last song he ever played with the Who at Shepperton Studios on 25 May 1978, which was captured on the documentary film The Kids Are Alright. The song was part of the Who's set at Live Aid in 1985, Live 8 in 2005, T4 on the Beach in 2008 and Capital FM's Summertime Ball concert in 2009, 2010 and 2015 and the radio station's Jingle Bell Ball concerts in 2009 and 2015. In October 2001, The Who performed the song at The Concert for New York City to help raise funds for the families of firemen and police officers killed during the 9/11 attacks. They finished their set with 'Won't Get Fooled Again' to a responsive and emotional audience, with close-up aerial video footage of the World Trade Center buildings playing behind them on a huge digital screen. In February 2010, the group closed their set during the halftime show of Super Bowl XLIV with this song. While the Who have continued to play the song live, Townshend has expressed mixed feelings for it, alternating between pride and embarrassment in interviews. Who biographer John Atkins described the track as "the quintessential Who's Next track but not necessarily the best." Several live and alternative versions of the song have been released on CD or DVD. In 2003, a deluxe version of Who's Next was reissued to include the Record Plant recording of the track from March 1971 and a live version recorded at the Young Vic on 26 April 1971. The song is also included on the album Live at the Royal Albert Hall, from a 2000 show with Noel Gallagher guesting. Daltrey, Entwistle and Townshend have each performed the song at solo concerts. Townshend has re-arranged the song for solo performance on acoustic guitar. On 30 June 1979, he performed a duet of the song with classical guitarist John Williams for the 1979 Amnesty International benefit The Secret Policeman's Ball. The song was first covered in a distinctive soul style by Labelle on their 1972 album Moon Shadow. Van Halen covered the song in concert in 1992. Eddie Van Halen re-arranged the track so that the synthesizer part was played on the guitar. A live recording was released on Live: Right Here, Right Now, and made it to number one on the Billboard Album Rock Tracks chart. Both Axel Rudi Pell (on Diamonds Unlocked) and Hayseed Dixie (on Killer Grass) covered the song in their established styles of metal and bluegrass respectively. Richie Havens covered the track on his 2008 album, Nobody Left to Crown, playing the song at a slower tempo to the original. ^ Cavanagh, David (2015). Good Night and Good Riddance: How Thirty-Five Years of John Peel Helped to Shape Modern Life. Faber & Faber. p. 158. ISBN 9780571302482. ^ Neill & Kent 2002, p. 273. ^ Marsh 1983, p. 371. ^ Atkins 2000, p. 157. ^ "Pete's Diaries – Won't Get Judged Again". petetownshend.co.uk. 27 May 2006. Archived from the original on 5 December 2006. Retrieved 8 January 2012. ^ Thompson, Dave (2011). 1000 Songs that Rock Your World: From Rock Classics to one-Hit Wonders, the Music That Lights Your Fire. Krause Publications. p. 22. ISBN 978-1-4402-1899-6. ^ a b Unterberger 2011, p. 27. ^ Neill & Kent 2002, p. 250. ^ Unterberger 2011, p. 28. ^ Unterberger 2011, p. 51. ^ Neill & Kent 2002, p. 279. ^ a b c Neill & Kent 2002, p. 280. ^ a b c Atkins 2000, p. 152. ^ Hunter, Dave (15 April 2009). "Myth Busters: Pete Townshend's Recording Secrets". Gibson. Retrieved 29 September 2014. ^ Marsh 1983, p. 382. ^ a b c Neill & Kent 2002, p. 284. ^ Neill & Kent 2002, p. 288. ^ Marsh 1983, p. 389. ^ Marsh 1983, p. 388. ^ "The Who, 'Won't Get Fooled Again'". Rolling Stone. Retrieved 17 January 2015. ^ Neill & Kent 2002, p. 278. ^ Atkins 2003, p. 23. ^ Marsh 1983, p. 479. ^ Marsh 1983, p. 499. ^ Edmondson, Jacqueline (2013). Music in American Life: An Encyclopedia of the Songs, Styles, Stars, and Stories that Shaped our Culture [4 volumes]: An Encyclopedia of the Songs, Styles, Stars, and Stories That Shaped Our Culture. ABC-CLIO. p. 280. ISBN 978-0-313-39348-8. ^ "Who Dat". Billboard. 6 February 2010. Retrieved 2 December 2014. ^ Unterberger 2011, p. 4. ^ Atkins 2000, p. 162. ^ Atkins 2003, pp. 24–26. ^ "Won't Get Fooled Again – Roger Daltrey". AllMusic. Retrieved 17 January 2015. ^ "Pete Townshend Goes Acoustic on 'Won't Get Fooled Again'". Rolling Stone. 11 October 2012. Retrieved 17 January 2015. ^ Bogovich, Richard (2003). The Who: A Who's who. McFarland. p. 198. ISBN 978-0-7864-1569-4. ^ "Won't Get Fooled Again – Labelle". AllMusic. Retrieved 2 December 2014. ^ Christe, Ian (2009). Everybody Wants Some: The Van Halen Saga. John Wiley & Sons. p. 190. ISBN 978-0-470-53618-6. ^ "Won't Get Fooled Again". Billboard Mainstream Rock Chart. Retrieved 17 January 2015. ^ "Diamonds Unlocked – Axel Rudi Pell". AllMusic. Retrieved 17 January 2015. ^ "Killer Grass – Hayseed Dixie". AllMusic. Retrieved 17 January 2015. ^ "Nobody Left to Crown – Richie Havens". AllMusic. Retrieved 17 January 2015. ^ "Hits of the World". Billboard: 45. 25 September 1971. Retrieved 19 January 2015. ^ "The Irish Charts – Search Results – Won't Get Fooled Again". Irish Singles Chart. Retrieved January 10, 2018. ^ "Cash Box Top 100 9/18/71". tropicalglen.com. ^ "Top 100 Hits of 1971/Top 100 Songs of 1971". www.musicoutfitters.com. ^ "Cash Box YE Pop Singles - 1971". tropicalglen.com. Atkins, John (2003). Who's Next (Deluxe Edition) (Media notes). Polydor. 113-056-2. Marsh, Dave (1983). Before I Get Old : The Story of The Who. Plexus. ISBN 978-0-85965-083-0. Neill, Andrew; Kent, Matthew (2002). Anyway Anyhow Anywhere – The Complete Chronicle of The Who. Virgin. ISBN 978-0-7535-1217-3. Unterberger, Richie (2011). Won't Get Fooled Again: The Who from Lifehouse to Quadrophenia. Jawbone Press. ISBN 978-1-906002-75-6. This page was last edited on 13 April 2019, at 01:08 (UTC).